As a first time attendee to the Santa Barbara Kennel Club, I was looking forward to the trip with great anticipation. I had only heard the most gushing of comments about the show – the high quality of dogs, the opulence of the special events and the special attention to detail to all facets of the show. I must admit that I was very impressed by the show and that the experience lived up to my great expectations. The show is held at the Earl Warren Showgrounds. The show site is spread out with various areas for outdoor rings, an indoor building for most Toy and Terrier breeds, and an arena used by the Santa Barbara Kennel Club for special events and various judging. The show site is neatly manicured and is especially beautiful in the typical California weather. The Friday show kicked off with the Simi Valley Kennel Club hosting on Friday, August 23rd. Mrs. Anne Savory Bolus judged Best in Show and awarded Best in Show to the Pembroke Welsh Corgi, GCh. Coventry Allure at Wyndstar. “Allie” is handled by Jenny Wornall-Rangel and owned by Alexandra Geremia and William Shelton. Mrs. Bolus awarded Reserve Best in Show to the Wire Fox Terrier, GCh. Afterall Painting The Sky. “Sky” is handled by Gabriel Rangel and owned by Victor Malzoni Jr. , Torie Steele, Mary Olund and Diane Ryan. The Santa Barbara Kennel Club’s show was updated the grounds from the previous date with banners and landscaping. The committee members were dressed to the nines and ready for a full day of regular breed judging, as well as special events. 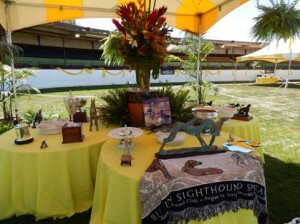 The club had a stunning trophy table for the winners of the show, special events, and Breeders Showcase. The regular classes ended with Mr. Luis Pinto Teixeira from Libson, Portugal awarding the previous mentioned Pembroke Welsh Corgi and Wire Fox Terrier Best in Show and Reserve Best in Show, respectively. The evening judging started with the Bullyganza and Sight Hound Spectacular events taking place in the arena. These particular events invite the Best of Breed, Best of Winners, and Best of Opposite Winners from Saturday’s breed judging in all sight hound and “bully” breeds to participate. These two events ran simultaneously in large grass rings and attracted a large crowd. Both events offered cash prizes to the first through fourth placements, as well as to the Award of Merits. Mr. Marcelo Veras awarded first in the Bullyganza event to the White Bull Terrier, Bestuvall Take It Easy, owned by David Merriam and Jan Dykema. Mr. Bo Bengston awarded first in the Sight Hound Spectacular to the Greyhound, GCh. Grandcru Phelps Insignia, owned by Melanie Steele, P Caddell, C Dabbs, Amy Phelan, and her handler, Rindi Gaudet. The Breeders Showcase was next on the schedule. It was held in the same manner as the previous special events, as two groups run simultaneously, while exhibitors and spectators that are not showing enjoy a fabulous dinner sponsored by The Canine Chronicle. 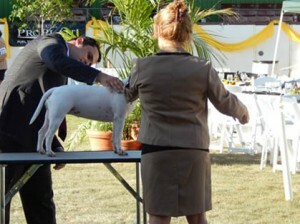 The Breeders Showcase begins on the group level, with pairs of dogs with one common breeder. The breeder does not have to be a handler in the event. The judges of this event were only the most premier breeders from across the country. The major awards of this evening included Ms. Lynda Gall awarding the Sporting Group to a pair of German Wirehaired Pointers bred by Franz Neuwirth and Christine Whitmore. 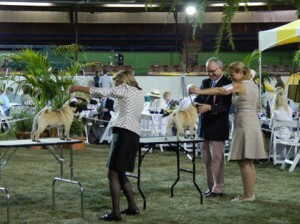 The Hound Group was one of the largest of the night and was topped by a pair of Norwegian Elkhounds bred by Mrs. Patricia Trotter, judged by Mrs. Susan LaCroix-Hamil. Ms. Sylvia Hammarstrom awarded a pair of Boxers first in the Working Group, with the common breeder of Kimberlie Steele, while Ms. Connie clark awarded the Terrier Group to two Airedale Terriers bred by Georgia McRae & Barbara Fakkema. Mr. David Fitzpatrick awarded a lovely pair of Toy Poodles the Toy Group, bred by: Ray & Sharon Stevens. Dr. John Reeve-Newson awarded two Bulldogs the Non-Sporting Group, bred by Dennis and Terri O’Conner. These bulldogs would eventually be awarded Reserve Best in Show, to the Herding Group winners, the Pembroke Welsh Corgis, bred by William Shelton, Steve Leyerly and Beckie Williams. The pair of Pembroke Welsh Corgis also included the Best in Show winner from the Friday and Saturday regular judging. The Herding Group was judged by Mr. Guy Jeavons. Mr. Geir Flyct-Pedersen from North Carolina and Mr. Augusto Benedicto Santos from the Phillipines were given the job of choosing between the seven lovely pairs of dogs. The Pembroke Welsh Corgis and Bulldogs walked away with the major awards of the evening, plus $1500 and $1000 cash prizes. Sunday’s judging ended with Dr. John Reeve-Newson judging Best in Show. 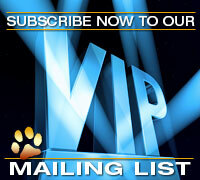 He is a long time member of the Santa Barbara Kennel Club and attended his first Santa Barbara event in the 1970s. 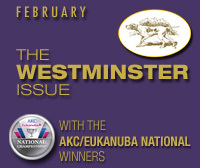 He awarded the Wire Fox Terrier, GCh. Afterall Painting the Sky, Best in Show. He also awarded the French Bulldog, GCh. Lebull’s El Morocco At Lecirque, Reserve Best in Show. He is owned by Alexandra Geremia and handled by Christian Rangel. Previous to the Best in Show judging, Mr. Marcelo Veras and Mr. Larry Cornelius judged the Foreign Bred competition. In this special event, the two judges eached judged half of the entries and made a cut of dogs to return to the final judging. The final judging awarded the Standard Poodle, GCh. Del Zarzoso Salvame From Afterglow, first place in the Foreign Bred Competition. “Dino” is handled by Amy Rutherford for owners Sloan Barnett, George Sinderman Sr., Michael Gadsby and Jason Lynn. 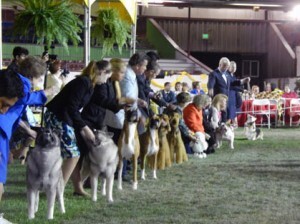 The Conejo Kennel Club hosted the final show on Monday. Many of the judges returned from the Friday Simi Valley Kennel Club. The Simi Valley and Conejo judges were able to play tourist during the weekend of the Santa Barbara Shows. Mr. David Bolus awarded Best in Show to the Saluki, GCh. Aurora’s The Song And Dance Man, owned and handled by Eugene Blake and Julie Mueller. Reserve Best in Show was the Maltese, Ch. Scylla’s Small Kraft Re-Lit, handled by owner Tara Martin Rowell, for owners Ron Scott and Debbie Burke. Kudos to the Simi Valley Kennel Club, the Santa Barbara Kennel Club, and the Conejo Kennel Club for organizing this top class event. Local exhibitors and visitors from a far raved about this special show, with it’s unique competitions and it’s out of the ordinary panache. Posted by chesliepickett on Aug 28 2013. Filed under Featured, iReports. You can follow any responses to this entry through the RSS 2.0. Both comments and pings are currently closed.